﻿"The overall idea behind this costume was comfort and and the ability to wash everything so I can wear it again and again! I made it back in 2005 and I still wear it to cons now! ... 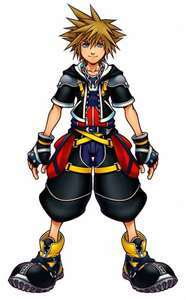 I especially enjoy wearing Sora because his personality is so easy going and goofy. I can basically be my grinning, dorky self and I am totally in character. It is the most compfortable costume I own... Because of the layers I never feel cold and because of the character I always have warmth in my heart." Wig: 80's punk rocker wig. Chosen for its anti-gravity "oompf" that helped with the spikiness. "Due to my noob cutting skills I finally took the wig to a friend a friend whose mom is a pro and she fixed it up. It looked so much better when she was done with it." Outer Jacket: Savannah used a hoodie pattern that she modified to have a pointier hood, shorter waistline, and tailored to fit to her body. She added white trim fabric and a zipper. "I used refernce picture to make sure I got the cartoony-ness and curves just right. I added white trim fabric and a zipper... my first zipper ever. When it zips up all the way it is half an inch off somehow, haha!" Shoulder Armor: This is essentialy a vynl "pillow" with thin foam on the inside that attaches to the jacket with velcro. The studs are silver buttons covers and the yellow straps are bias tape. "The buckles came off a little cosmetic purse I found at the thrift store." ﻿Tank Top: an altered thrift store tank top. 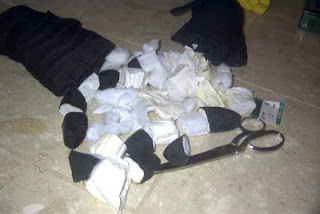 Gloves: a pair of Gore-Tex gloves with the fingers cut off, bias tape strapping, button covers, and a peice of vynl. You can see how much stuffing was in the gloves! Necklace Pendant: Fun foam painted with silver nail polish. Pants: basketball short, sweatpants, elastics, white fabric trim, and batting. "I wear a regular pair of blue basketball shorts. Then, on top for the 'chaps' or whatever you call them, I fuond a very large pair of sweat pants that I cut the groin area out ot, put elastic at the top so it would fit my waist, and elastic at the bottom do they would fit snugly just below my knee. I added white fabirc trim and filled the bottom of the pants with batting so they had the 'puffed' shape." Red Hip Bags "Saddlebags? ": denim-like fabric﻿, black nd yellow straps, and velcro. "I added velcro to the flaps so the pockets are fully functional and I can carry everything I need around the con in them. I also put velcro on the ends of the yellow straps so that I can easily take them on and off." "The only things missing fromt his outfit are a blu belt and the terrifying yellow "boat shoes" which I never attempted to make. I was worried it would be hard to wear them so I usually wear my comfy pair of Airwalks. Because of the "sport/street" nature of the costume it works well and no one seems to notice. I also carry around anice keyblad that was a gift from a friend. 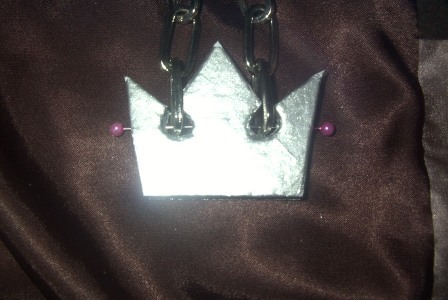 It is a solid peice of metal so it is very heavy but will make you strong for battles ahead!" 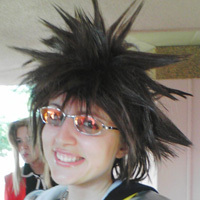 Savannah, along with her awesome crafting notes, left me with two really fun experiences she had when she wore Sora. Cosplay can lead to such fun and entertaining moments! "No... he seamed nice though..."
'We flipped out. It was so random. When Dennis came back out of the building we begged him for a quick photo. He is SO tall! It was a really funny random celebrity encounter and we were all in cosplay!"